Many of us here have seen the brutality of this day as it is depicted in the film The Passion of the Christ. After seeing the horror of what our Lord endured, some are led to ask, "Did it all have to happen this way? ", and "Couldn't Jesus have saved us in another way?" Yes, Jesus could have simply stated, "The world is now redeemed," and it would have happened. And yet, He didn't. He didn't choose to make it easy, to make it pleasant. In fact, the manner in which our Lord freely chose to lay down His life continues to baffle non-believers. St. Paul was quite correct: the paradox of the Cross - victory in the midst of suffering is a stumbling block for the Jews and folly to the pagans. So, how do we make sense of this greatest act of love? St. Thomas Aquinas puts it this way: the way in which God made man, Jesus Christ, chose to die was the most fitting way for Him to redeem us. You'll recall that for centuries, the Jews had been offering Temple sacrifices in order to make restitution for the sin of Adam and Eve and for their personal sins. These sacrifices mostly took the form of animal sacrifices - goats, lambs, bulls, etc. While these were well-intended, they were all imperfect sacrifices because the animal victims were all imperfect. So, the only way to have a perfect sacrifice was to have a perfect victim. That victim is Jesus Christ our Lord. He is the divine person who takes on human nature, perfect human nature drawn from the Blessed Virgin Mary. He is a divine person who assumes perfect human nature. He is the perfect sacrifice and not only that - He is also the priest who offers the sacrifice of Himself. When the Father gazes down on Calvary on Good Friday, he says, "Ah, at long last - a sacrifice that pleases me in a way none of the other sacrifices did - this is the perfect sacrifice because this is the perfect victim. This sacrifice satisfies divine justice and now opens the gates of heaven, which to this point had been closed since the original sin of Adam and Eve in the garden. 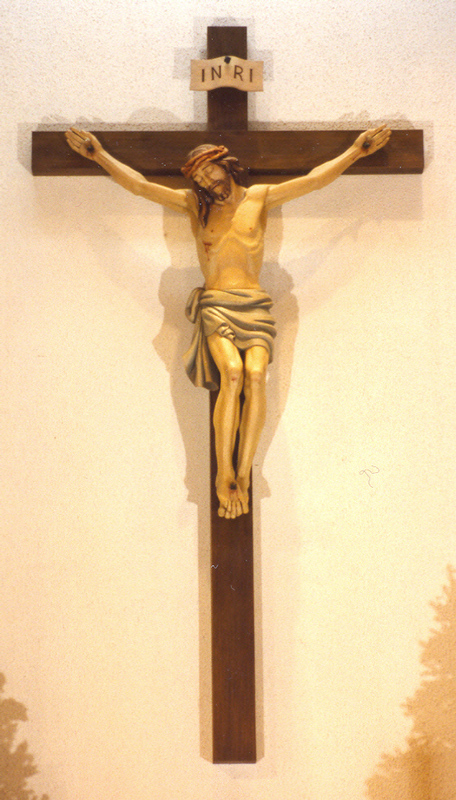 If you like the Franciscans, they traditionally answer this question by asserting that while Jesus could have saved us in a different way, He did so in the way that He chose because it would give us the finest example of what it means to die to self and to die for others - after all, man has no greater love than to lay down his life for his friends. Jesus in the great exemplar of self-sacrifice. In any case, our Lord died in the way that He did and that has made all the difference. He was willing to go to the very depths of desolation and abandonment in his humanity in order to expiate us of our sins. The Cross of the Lord Jesus is the gate of heaven, the answer to all of our problems, the hope of the nations. Jesus overturns the idea that vengeance is the key to peace. Rather, He proves that self-sacrificial love conquers all - that light is stronger than darkness, that truth overcomes falsehood, that the laying down of His life makes all things new. That not only means that our Lord breaks the shackles of sin and death, but now, the entire created order is renewed and reinvigorated with the self-sacrifice of God the Son back to God the Father in the unity of the Holy Spirit. Throughout this Lent, we have been listening to 40 first readings in the Mass that have been prophecies of the Messiah. It should cause us to pause when we consider how our Lord perfectly fulfilled each one of them in his suffering. Only the God-man could fulfill the prophecies in the way that our Lord did. Even historians tell us how impeccable our Lord's plan of redemption was. Consider for a moment that when our Lord is crucified at noon, outside the city gates of Jerusalem, the temple priest in the city was offering the lamb of sacrifice at the very same hour of high noon. The noon sacrifice entailed taking a lamb and spreading it wide open in the crucified position and making holocaust of the animal by slaying and burning its flesh. Just several hundred yards away, out Lord was being sacrificed in the exact same position - the spotless Lamb of God who removes the sins of the world. One of the most gripping subplots that occurs in all of this and one that is so well depicted in the movie The Passion of the Christ is the cosmic battle raging on between our Lord and Satan. In the film, Satan tempts our Lord to abandon his salvific mission. The devil says, "No one man can bear man's sins. No one. Ever. No. Never." Satan attempts to point out the impossibility of Christianity. Sadly for Satan and happily for us, Christ makes the impossible, glorious. We are reminded consistently, that the Passion, Death and Resurrection of Jesus was not only a historical event that occurred in isolation. It is more than that - the Paschal Mystery defeats darkness and sin and the devil himself is vanquished. From the time of the fall of Adam and Eve until the first Good Friday, heaven was not attainable for the souls of the just. They could not pass from this life unto eternal glory because the gates of heaven remained shut as a consequence of original sin. Christ, in conquering sin and death opens for them and for us the possibility of entering into heavenly glory - the glory that only He could secure for us in His mercy. Thus, the Paschal Mystery is the new Passover. Christ's death at Calvary is the hour of glory and his finest work and finest teaching moment. It is said that the three hours that our Lord endured on the Cross was greater than what He accomplished in the three years of His public ministry. What this should tell us that to suffer is to be most Christ -like for our Lord reigns in suffering. While there are many people here on this day of penance, of fasting and abstinence, there aren't nearly as many people here as there will be on Easter Sunday. It's as if we all want the glory of the Resurrection without the suffering of Good Friday. We want the comfort of knowing that there's life after death but we don't want to go to Calvary in order to get to Easter Sunday - almost to say that suffering has no meaning. Come and visit my shut-ins with me some week and tell them that their suffering means nothing, that they are not making up for what lacks in the suffering of the body of Christ, that souls are not being released from purgatory because of their offering-up what they endure. The grand irony is that it's our parishioners who are not here because they are shut-ins they are those who understand the Cross better than most of us here present and certainly much, much more than those who avoid this day of prayer. In a few moments, we will have an opportunity to venerate the Cross. Each of us approaches this moment with different dispositions. We bring our fears, our hopes, our sufferings and our problems. No matter what we bring to the Cross, we all do well to bring the one thing necessary: our love. For as Christ hangs in agony on the Cross with arms outstretched for you and for me, he says very little in words but His actions cry out loudly to each one of us "I LOVE YOU . . .I LOVE YOU . . .I LOVE YOU." We adore thee, O Christ, and we bless thee . . .BECAUSE BY YOUR HOLY CROSS YOU HAVE REDEEMED THE WORLD!